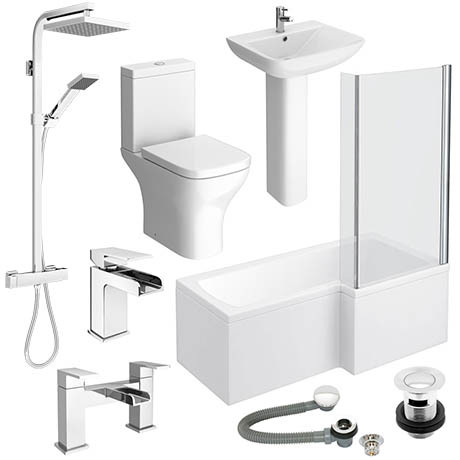 The Venice L-Shaped 1600 complete bathroom package includes everything you need for creating a stylish modern bathroom in your home. Optional bath end panel (WBS301) sold separately. For use with square shower baths. Square thermostatic mixing valve of brass construction with built-in diverter and polished chrome finish. High water pressure systems may need to reduce the flow of water for waterfall effect to work effectively. Very helful staff and great prices. Nice looking suite very little instructions. "Quality bathroom suite, exactly what we needed and looks great!"